Dublin-based photographer Martin Marcisovsky captures some interesting silhouettes fixed in equally engaging landscapes. These small figures appear to be either deep in thought or on some kind of journey with their backs facing us, the voyeurs peering into their dreamy scenes. The surreal imagery leads one to believe that these worlds are perhaps within the minds of each subject. 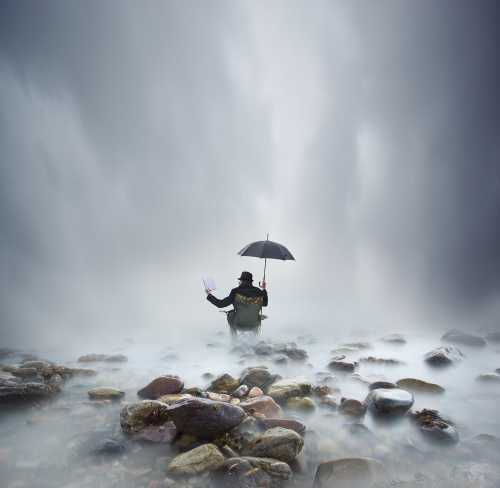 In his photo titled Me In Many Ways, we see a self-portrait of the photographer sitting atop what appears to be a misty riverbed at the bottom of a waterfall with an umbrella and a book at hand. It's an unusual spot for a read and raises many questions. What is he doing there? Why did he choose this spot to read? Is he lost? The photograph's accompanying caption gives some insight into the photographer's intentions: "Within the silence of a day, within the silence of a life time, within this life or the next, sit in this space and see, see the person you are." Whether the subject is a child or an adult, they each evoke their own level of self-discovery. Essentially, there are two ways to interpret each image—as a representation of feeling lost and isolated or a visual interpretation of contemplatively being in tune with oneself. It's up to the viewer's own intuitive perspective to decide how they interpret the intriguing series of works. 1X Tutorial book 2013 with the image Emma , 1X Passion (2nd book 2013) with image of mine September. Published in the book Visions by 1X with the image "The Steel World"